The value of Wall Street professional of generating superior investment returns is proved to be doubtful. Individual investors on Main Street have unique but often neglected competitive edges compared to Wall Street. I list the reasons (of why) and the strategies (of how). In case you are not fully convinced to DIY, just look for low-cost index funds (which still beat the Pro). The regular releases of the S&P Index-Vs.-Active report card "SPIVA" show that over longer time periods, there are only 10-20% of mutual funds that can beat the index. The ones that just did, rarely do it again. Wall Street Pro may look brilliant on the first few sights. But after digging deeper, you may soon conclude doubts regarding their values in aggregate in terms of generating investment returns for Main Street. 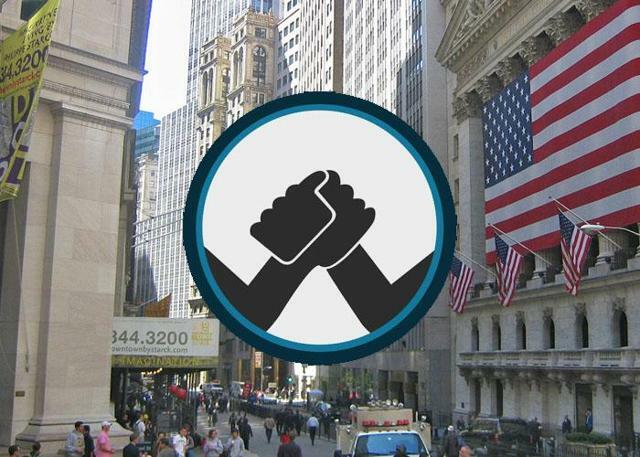 Actually, individual investors on Main Street have unique but often neglected competitive edges compared to Wall Street, offering themselves high chances of beating the Pro for the long run. Below, I summarize the main reasons why the pros can rarely beat the market average but some individuals should have a high chance of doing so (along with the recommended portfolio strategies). 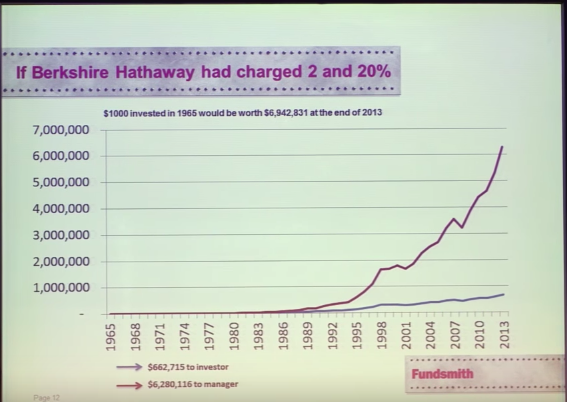 As is shown, this investor, after 35 years of investing career, would contribute 30% of the total assets that could have been accumulated under the no-fee scenario to fatten the pocket of fund managers. This is not the worst case yet - think about GPs (i.e., fund managers) of those hedge funds or private equity funds, which normally get paid 2/20 (i.e., 2% annual management fee plus 20% of the investment returns) from their LPs (i.e., high-net-worth individuals or institutional clients). Here is Terry Smith's (founder of Fundsmith Equity Fund, the consistently top performer among equity funds) favorite example: what if Berkshire Hathaway (BRK.A) (BRK.B) is a hedge fund or private equity fund charging 2% annual fee and 20% performance fee and Warren Buffett is the GP of the fund. As described below, between 1965 and 2013, the majority of the returns (90%) would have gone to Warren Buffett's own pocket, leaving only 10% on the table for his hypothetical LPs. Leveraging his fantastic capital allocation skills, Warren does have outperformed the market for shareholders but would have no chance at all with such a typical free structure. Actually, the Oracle of Omaha is the long-time proponent of low-cost index funds in light of most investors. This advice is echoed by his famous 1 million dollar bet that an S&P 500 index fund would outperform a collection of hedge funds after fees over the course of 10 years (see the result below). Without being charged the fee, individual investors would significantly lift their levels of returns in the long term. The below table shows that, with an initial investment of $100, a hedge fund manager charging the typical 2/20 fees would need an additional 5% return annual in order to barely approximately match the hypothetical 10% annual return by a passively-managed fund charging 0.1% (although many index funds nowadays even charge zero - check out some of the products offered by Fidelity). To beat the Pro, one approach for individual investors is simply to keep their investment costs as low as possible. This could mean trading less actively, never paying performance fees, finding low-cost index funds, and/or avoiding expensive brokerages. Most institutional investors suffer from the so-called "size disadvantage" - they would have to deploy a sizeable amount of capital of the funds to move the needle, which usually limits their investment choices to large-cap stocks only. Even within that large-cap stock scope, additional restrictions may apply in terms of ownership percentage. For instance, no matter how Warren Buffett loves banks, Berkshire Hathaway may want to keep their holdings in any US bank under 10% in order to avoid being a bank holding company subjective to more regulations. All the above would not be an issue for individual investors with much smaller money bases, providing their strategies with the advantages of greater flexibilities as well as a larger pool of investment choices to beat the Pro at the disadvantages. To beat the Pro, individual investors are suggested to focus more on smaller-cap stocks. You may find that plenty of small- and mid-sized businesses, such as Credit Acceptance (CACC), NIC (EGOV), OTC Markets Group (OTCQX:OTCM), meet the investment criteria (e.g., superior ROIC, high margins, strong cash flow, clean balance sheet) of guru investors but have been underrated on Wall Street. Unlike individual investors managing money under their ownership, professional fund managers usually deal with clients' money which they do not fully control. This means that panic investors would pull out money at market lows and greedy investors would add in money at market peaks, which would negatively impact fund managers' performances. To beat the Pro, individual investors should avoid emotions influenced by Mr. Market. The market is there to serve investors not to instruct them. They are also advised to set up additional funding for rainy days so as to be able to stay fully invested or even add money during recessions. Many fund managers tend to chase hot stocks. Remember the internet era in the late '90s when you would look "stupid" without any position in the tech sector. Wall Street professionals face pressures from peers, media, and clients, which often override their independent thinking. This behavioral bias due to fear of missing out may cultivate bubbles, causing unjustified high pricings and lower-than-average returns. To beat the Pro, individual investors need to stay objective in terms of investment decisions, avoid herd mentality, focus on the long term, and dare to go against the prevailing mindset if necessary. They may also want to get cautious about hot jargons like FAANG, BRIC. Wall Street professionals are expected to beat the market. But what is the timeframe for them? Unfortunately, it would be year-by-year at most and sometimes quarter-by-quarter or even month-by-month. For example, most fund ranking sites, like Morningstar (MORN), evaluate fund managers' performances on a monthly basis. Additionally, the performance fee is usually calculated annually per the industry standard. Therefore, institutional investors are naturally forced to think short term, often taking unnecessary risks to their portfolios. To beat the Pro, individual investors should leverage their naturally-born competitive advantage of being able to trade short-term volatilities for long-term gains. They may also want to allow performances of their portfolios to significantly deviate from underlying benchmarks, which will be discussed in the next section. There are studies indicating that professional money managers in general invest in more stocks than necessary for their funds. Part of the reason here is that fund managers are afraid of deviating their portfolio performances too far away from the major indices to avoid embarrassment. This phenomenon, on the one hand, leads to diversification, which lowers so-called unsystematic risks, but on the other hand, reduces the chance for the overall portfolio to outperform the market average. If such diversification (to minimize unsystematic risks) is still what investors need, why not consider a passively-managed fund? I can't be involved in 50 or 75 things. That's a Noah's Ark way of investing - you end up with a zoo that way. I like to put meaningful amounts of money in a few things." I would build a portfolio of 15-20 high-quality businesses and wait patiently to accumulate more of their shares over time. Stock investing is not for everyone. But if you have the emotional capabilities of staying objective, focusing on the long run, not panicking for the short term, and being patient, why not grab your chance of beating the Wall Street Pro? In case you do not, just follow this simple approach - invest in low-cost index funds, sit back and relax. I am sure that you would beat the very majority of professional fund managers over time by almost doing nothing! Disclosure: I am/we are long MOST OF THE STOCKS MENTIONED. I wrote this article myself, and it expresses my own opinions. I am not receiving compensation for it (other than from Seeking Alpha). I have no business relationship with any company whose stock is mentioned in this article.